CFEngine Enterprise is an IT automation platform that uses a model-based approach to manage your infrastructure, and applications at WebScale while providing best-in-class scalability, security, enterprise-wide visibility and control. CFEngine Enterprise provides a secure and stable platform for building and managing both physical and virtual infrastructure. Its distributed architecture, minimal dependencies, and lightweight autonomous agents enable you to manage 5,000 nodes from a single policy server. WebScale does not just imply large server deployments. The speed at which changes are conceived and committed across infrastructure and applications is equally important. Due to execution times measurable in seconds, and one of the most efficient verification mechanisms, CFEngine reduces exposure to unwarranted changes, and prevents extreme delays for planned changes that need to be applied urgently at scale. Automate your infrastructure with self-service capabilities. CFEngine Enterprise enables you to take advantage of agile, secure, and scalable infrastructure automation that makes repairs using a policy-based approach. Achieve repeatable, error-free and automated deployment of middleware and application components to datacenter or cloud-based infrastructure. Along with infrastructure, automated application deployment provides a standardized platform. Gain visibility into your infrastructure and applications, and be alerted to issues immediately. CFEngine Enterprise contains built-in inventory and reporting modules that automate troubleshooting and compliance checks, as well as remediate in a self-healing fashion. The CFEngine Enterprise Mission Portal provides a central dashboard for real-time monitoring, search, and reporting for immediate visibility into your environment’s actual vs desired state. You can also use Mission Portal to set individual and group alerts and track system events that make you aware of specific infrastructure changes. CFEngine Enterprise has a simple distributed architecture that scales with minimal resource consumption. Its pull-based system eliminates the need for server-side processing, which means that a single policy server can concurrently serve up to 5,000 nodes doing 5 minute runs with minimal hardware requirements. The CFEngine Enterprise Mission Portal provides System Administrators and Infrastructure Engineers with detailed information about the actual state of the IT infrastructure and how that compares with the desired state. CFEngine Enterprise has the ability to create federated structures, in which parts of organizations can have their own configuration policies, while at the same time the central IT organization may impose some policies that are more global in nature. 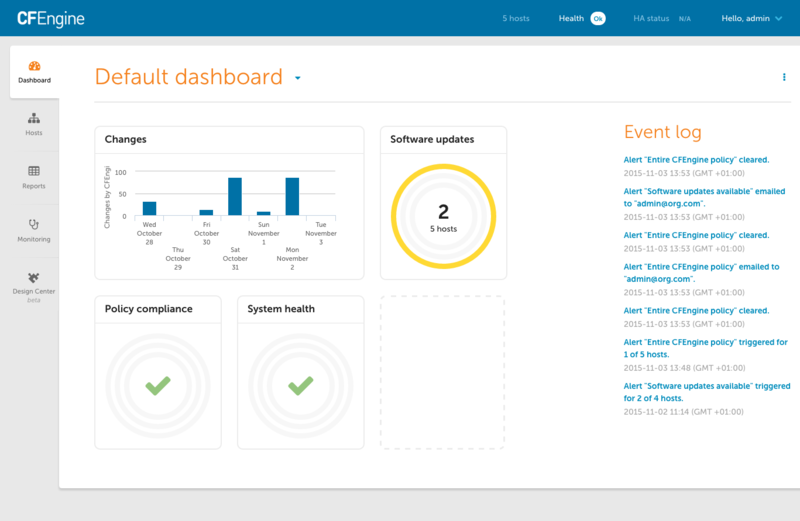 The CFEngine Enterprise Mission Portal contains continual reporting that details compliance with policies, repairs and any failures of hosts to match their desired state. Users can be assigned roles that limit their access levels throughout the Mission Portal.